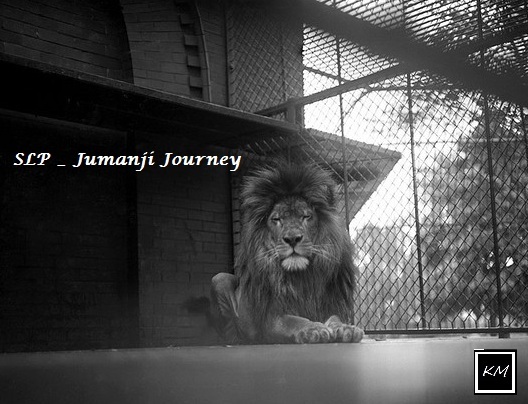 I selected “SLP_Jumanji Journey” because this year has been crazy, exciting, and stressful. Jumanji, a movie released in 1995, was about kids finding and playing a “supernatural” board game. The catch is, once they started playing, they couldn’t stop. To thicken the plot, “[the game] makes wild animals and other jungle hazards materialize upon each player’s move.” Sound familiar? …That is the equivalent of the first year of SLP graduate school. Once you enroll, there is no going back. You need to be 100% committed; if not, then you just might be chased away by a wild animal…or have to drop out (The latter seems to be more typical than the former). Once you think you have every session plan mastered, SOAP note written, and “jungle hazard” tackled, there seems to be another meeting, test, or rhino in the middle of your SLP street. Fortunately, there is always a hero (or 2) to every story. The heroes in my SLP_Jumanji Journey seem to be friends, family, humor, this blog, and a supportive program. Who are your heroes in your SLP_Jumanji Journey? Please do not mistake this term and post for regret, defeat, or negativity. I am BEYOND excited to be in my 2nd year, and happy to have every ounce of knowledge the first year (Jumanji Journey) gave to my lifebelt of experiences. This post is more of an Advisory to those about to start or thinking about starting an SLP Master’s program. The journey is long, arduous, and time-consuming; but the SLP_Jumanji Journey is entirely worth the jungle hazards.